The overwhelming feeling of having too much work than you can handle is something every single Mom knows all too well. Having too many tasks to do can be a real drag. If you’re a mother who wants to run a business, it is essential to understand the power of Outsourcing. 1. Hire a secretary or occasional helper to clear up your small task workload. Whether this is you know or someone you must seek out using free online ads is up to you. 2. Using online sources such as Fiver or iWriter for a small fee. These websites ensure the job is done and also by people who know what they’re doing. These sites rank their members and reviews show how qualified your potential employee is. 4. Some moms outsource stay at home tasks such as cleaning, and lawn care to professionals. For example, since I don’t know how or care to mow the lawn, I hire a landscaper in my area to periodically get the job done and I’m free to focus on what’s important. These methods are but a few of what you can do to outsource your work. Business women should focus on the bigger picture of their business, It’s extremely easy to get sidetracked by repetitive and quite annoying little tasks. Outsourcing allows you to scratch these tasks off your to-do list and focus on growing your career and business. Buying an office is a tasking and stressful job. This is especially so for women in business as some of them might have kids and a home to look after. Buying an office only adds to their numerous responsibilities. However, what if you could just set up your own office at home? No lease or rent charges and most importantly, your kids are just in the next room, hence not compromising on your duties as a mom. Wouldn’t this be great? 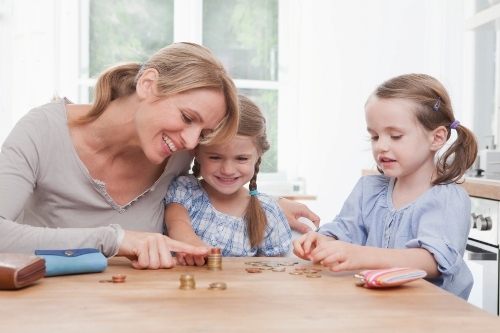 As simple as it sounds, there may still be things that a mom will need to think through. Where will the space be put? How will it be filled? What will be the cost of creating the office space? The questions are endless, but on the bright side, finding their solutions will not be as stressful as purchasing or leasing an office space somewhere else. When you talk of a home office, most people fantasize of a well-furnished office that is an extension to a home. However, this is not the case as most moms do not adequate disposable income to make this into a reality. Furthermore, if you are living in an apartment or small home, getting enough space for such a venture might prove to be very tricky. So, the big question arises, where can I put an office in my home? The closet is a good place to begin. Yes, the closet. It is not uncommon for work-at-home moms to turn their spare closets into home offices. It is simple and quite affordable. Custom make the desk to allow it to fit into the space. A small filing cabinet may also be added. Doing this will certainly give you more decorative freedom. A family room or bedroom corner is also another popular option. As a mom, you can buy a corner desk and paint the space a color that suits you. You may also visit your local home improvement store and purchase molding that will be used to frame the corner. Surprisingly, apart from serving as an office, the area will also look elegant to your guests. The guest room is a perfect location for a home office. You can set up your space either in on one of the corners in your guest room or the guest room closet. Try and think of how many times in a year you use the guest room. You might be surprised to find the count does not go beyond one hand. Add shelves onto one of the walls and bring a small desk without forgetting to include a filing cabinet. This will allow guests to have a desk that they can use during their visit while also allowing you to have your own office space. Why keep the room closed when it can be a great asset in your business? For any woman in business, an office is an essential part of her activities. Instead of looking for an office space to buy, kill 2 birds with one stone by setting up an office in your garage, attic, or even shed. As a mom, building your own business brand is important but your family should also not be neglected. The job of a mom is a huge one. Mothers are the multitaskers of all multitaskers. They can cook dinner, help a child with their homework and clean the kitchen all at the same time. Mom’s work is never done. When baby is asleep, she is being the domestic goddess and the ultimate wife. How does she get everything done? Magic! As time has gone by, mother’s have gone from staying home and raising the children, to working in the workforce and now to owning their own business. So now, moms are not just domestic goddesses, great moms and fabulous wives, but they are now adding accomplished business woman to their illustrious title. There are many reasons why mothers have decided to start their own businesses. Starting your own business is a huge decision. This is not a decision to be made lightly. Yet more and more mothers are making the choice to start their own. Why is that? The reason moms are deciding to start their own businesses can be summed up in one word: Flexibility. The economy has not bounced back completely yet. There are still countless men and women out of work. Women still make less than men in the work place, even when they hold the same position. Sometimes in life when the opportunities are not coming your way, you need to create them yourself. As mothers we really, deep down inside, want to be home with our tiny humans but we must provide for them also. Unfortunately, America has not gotten on board with more family friendly positions. If a mom wants to have the flexibility of working and being with her kids, she has to either find a job that is more family friendly or create her own money making opportunity. Modern technology has changed the way we do business in America. There are more companies embracing the idea of telecommuting. Telecommuting makes it easy for anyone to work from home and have a very flexible work schedule. Telecommuting saves people time and money. When you do not have to travel into the office, you do not have to spend money on gas, day care and expensive clothes. Your furthest commute is from your bedroom to your home office. Moms of today want to be present in their children’s lives and support them at the same time. They are using modern technology and their business skills to create businesses that give them the freedom to work from home. It is really easy to have an home office and have your children a room away. A mother that teaches an instrument like piano, can teach individual lessons from one room of the house while her children are present in the other room. She can work her schedule around school events, children sports and doctor’s appointments. Starting a business is a lot of work. Mothers work 24/7 as it is. Starting your own business will add more work hours to your day. Bright side is you will be with your kids. Mothers with their own business are the boss. You make the rules. If you start a business outside of your home, no one can tell you your children cannot be there with you. That is the great beauty of starting your own business. Mom business owners will change the face of business for everyone. Despite the constant calls for gender equity, women are still not given as many opportunities as their male counterparts. Most women in business are often misjudged and rarely get credit for the good work that they do. There are many myths and wrong perceptions about women who are in business hence it is important to clear them and recognize the efforts these women make in business. Women are capable of achieving as much as men can thus some of the strengths about women who are in business are discussed below. Women in business care about their teams. In business, it is important to work together as a team when tackling problems so that you can be able to come up with the best way to solve an issue. Women ensure that they are part of a team and ensure that they come up with the best solutions for their business. It is not by surprise that most women are coaches or mentors since they can be able to bring people together and reason. It is through their concern and care for the teams they are working with that help them find the right solution to problems they encounter. Women that are in business are known to be smart. It is not possible for a person to conduct business without understanding what it is all about. In order to be able to carry out business, there are many aspects that people have to learn and understand so that they are able to achieve success. Women understand this thus they are well educated on business matters and often ensure they are up to date with the current affairs of business matters. They are also likely to know what will work out and what will not. Though they take risks, they ensure that the margin of failure is as minimal as possible as they don’t invest blindly. Women in business are capable of running business without having to constantly seek help in tackling any problems that the business is going through. There are people who perceive women to be weak and incapable of making decisions on their own. However, those that are business are known to be tough and properly equipped to be able to make decisions on themselves. No matter the kind of business problem that is within their disposal, they know exactly what the best course of action is. Most women who are in business know how to take charge of the business or any emerging issues with the business. There is nothing as important as ensuring that you are able to take control of your business and run it the way it should. Women are known to seize the moment and take control of how things are done. The fact that they are always ready to listen and learn helps them know exactly which the best way to handle situations is. Even with the right statistical information, there are other business aspects that one must consider too ensure that the business has a long life. That is why women ensure that are surrounded by like minded people.